I left Obie, my assistant, in charge of the Thanksgiving Feast for the animals and well, nobody but the dogs are impressed with the results. 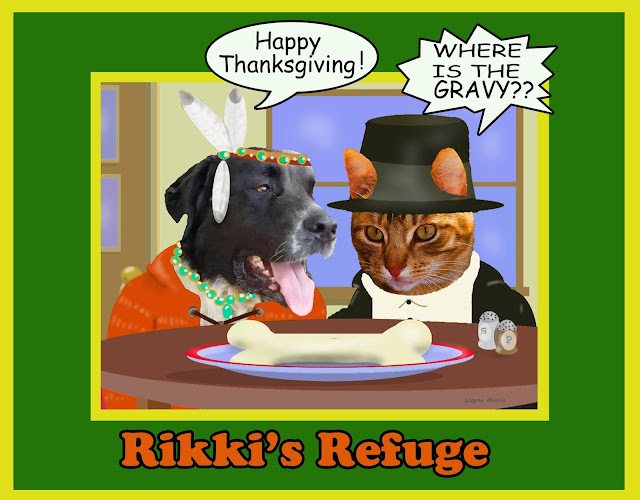 Can YOU help me earn enough green papers in time to make sure that all the animals at Rikki's Refuge have a happy Thanksgiving this Thursday and a nice meal of what they like ? I've got to raise $1304 before THURSDAY - and that's just tomorrow - to make everybody happy and full !!!! Won't you skip just one cup of coffee or one donut to help make 1304 animals HAPPY ??? Please ask all your friends to help me too !!!!!!!! Here's the quick run down ..... I'll try to pop back in soon to tell you MORE !!!! Hurry!! It's back! Our Nom Nom Popcorn fundraiser is underway TODAY through December 9 - Just in time for the holidays!! Rikki's Refuge earns 30% of each sale AND you don't have to wait until the end of the sale for your products. Your order will arrive within 7-10 days of placing it!! **Java Nom’s” Coffee – Eye-Opening Varieties of Delicious Coffee to please every java lover! **Mama Bear’s” Pickles & Peppers – Tempting Pickle and Pepper Products to add a little zing to meal or snack time! **A New Line of Savory & Sweet Flavored Nuts! Scrumptious Peanuts and Almonds and Cashews, oh my! 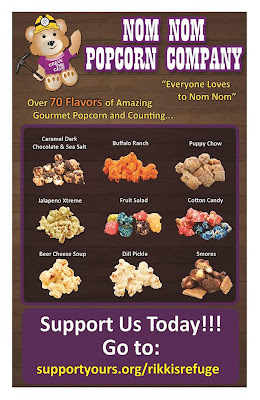 www.supportyours.org/rikkisrefuge order for YOU and for your popcorn loving friends on your Shopping List .... TODAY !! You eat popcorn ... I get Fancy Feast !!! You can pick who you'd like to spend the day with. We'd pick the animals ...... and if you do too come to Rikki's or spend the day volunteering at a local sanctuary or shelter and helping the animals who are so often forgotten during the holiday season. The future of the planet and every soul on it, is in YOUR hands. Spend the day with us at Rikki's, working with our Sanctuary Manager, assisting in feeding of the animals, cleaning of the animal areas to include scooping poop, raking poop, and disposing of the poop! Yup, it's a lot of poop !!! It is outside work, so dress for the weather, bring your animal-friendly lunch (this means to share but don't bring animal parts to eat), and work from 10 am until 3 pm!! 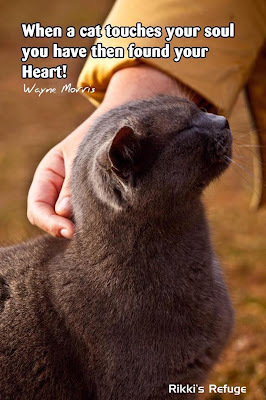 It's hard work, but with great rewards and our volunteers will get LOTS of animal interaction (in addition to animals in pastures and pens, we also have many free range cats, dogs, goats, turkeys, peacocks, ducks, geese, chickens, etc that will likely be your shadows!). We are a life care sanctuary with 1300 animals, both domestic and farm, of 22 different species - from cats, dogs, turkeys, emus, cows, pigs, goats, and everything in between!! Why not try something different for Black Friday?? You must sign up in advance to attend !!! Send an email to VOLUNTEERS@RikkisRefuge.org NOW for your free ticket !! 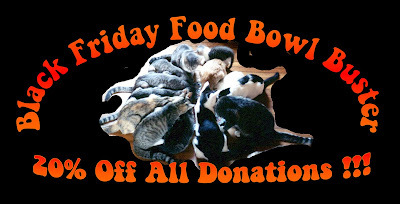 BLACK FRIDAY FOOD BOWL BUSTER – 20% Off ALL Donations!!! 20% Off Your Donation Shopping at Rikki’s Refuge From midnight Thursday thru 11:59 pm Black Friday, we’ve got the best shopping idea EVER! are topped with 20% …. YOU donate $80 and our Black Friday Donor drops in $20 …. and the animals get FED $100 of food!! Rikki’s 20% off Donations Shopping Spree just got BETTER! How many folks are on your Christmas list? Tired of shopping, spending money on gas or postage, fighting over parking spots, getting mugged in malls? just tell us who it’s for, anything special you’d like us to say from you, their name and snail mail or email address … we’ll take care of the rest …. MIDNIGHT Thursday thru 11:59 pm Black Friday !!! AND get your Holiday Shopping ALL DONE TODAY with no trouble, no hassle!! Can you possibly think of a better gift to give someone than saving a life in their honor? 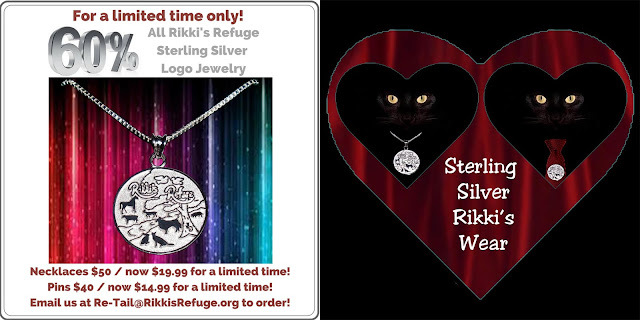 Our fabulous authentic sterling silver Rikki's Refuge lapel pins and necklaces (custom made for us by Michael Gallagher Jewelers) are MORE than half off this weekend!! The pins are normally $40, and the necklaces are $50. But for a limited time this weekend, that brings them down to $14.99 and $19.99 respectively! They've never been this low, and may never be again! And there are limited quantities! Get your necklace and pin at deep deep discount NOW !!!!! Or you can buy on line and we'll ship to you !!!!! And shipping is $4 to U.S. addresses. International? Just let me know what country, and we'll let you know. HURRY ... inventory is running low !!! You can feel good about supporting stores like Re-Tail where 100% of sales stay with the Rikki's Family, supporting the animals that YOU love !!! No corporate CEO's or CCO's getting fat ... well ... not fat with green papers !!!!! 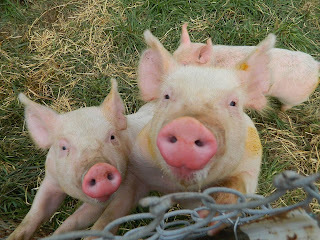 Mom be our CEO - Chief Excrement Officer and she don't get no green papers at all .... not even any to buy a veggie burger .... sometimes Petunia will share an apple with her. THANK YOU for supporting Rikki's Refuge and Saving Lives !!!! Your EVERY purchase at Re-Tail makes a difference !!! Money raised during this opportunity be matched by the Bill & Melinda Gates Foundation, and Facebook is waiving all fees, so every penny donated AND MORE goes directly to Rikki's Refuge. It's simple for YOU to set you your own plea on facebook for donations for Rikki's Refuge. Just ask me how, Vincent@RikkisRefuge.org or message me on facebook, https://www.facebook.com/Kerry.Hilliard yeahhhh I know ... it's got HER name on there, but it's really MY facebook page !!!!! It won't cost you a thing !!!! 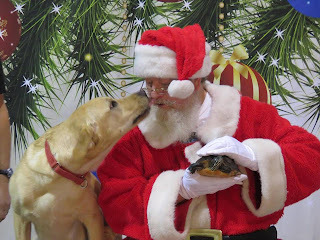 Is donating to save a life on YOUR Christmas Wish List? This is the PURRFECT opportunity to ask all YOUR friends and family to make a donation in you honor and as your Christmas Gift (like who needs another scarf, right?) AND to have it DOUBLED !!!! Check our facebook pages on TUESDAY and donate thru any one of them marked as GIVING TUESDAY DOUBLES ..... and seriously ... think about doing you very own fundraiser .... it's really really easy and I'll walk you turn setting it up !!!!! Pick any of those pages and look for our Giving Tuesday DOUBLES !!!! You receive 1 print plus a cd with all the pictures we take of your family. Appointments are preferred and will provide a guaranteed time, but walk-ins are also welcome. 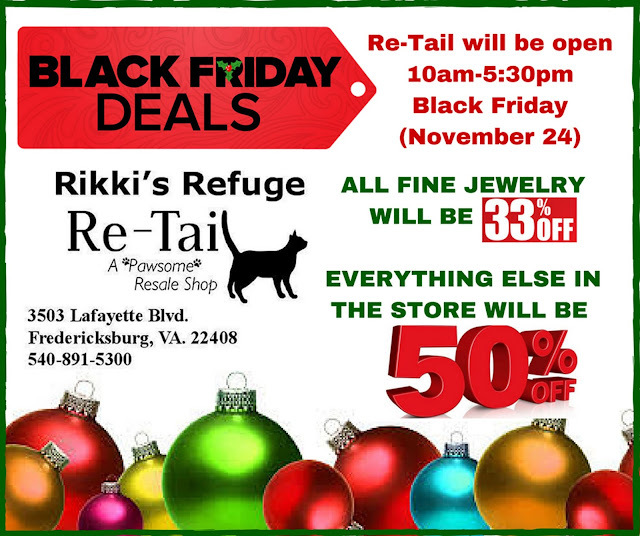 Slots fill up quickly, call 540-891-5300 or email Re-Tail@RikkisRefuge.org us asap to schedule your appointment. Help customers, help Rikki's and have fun all at the same time! 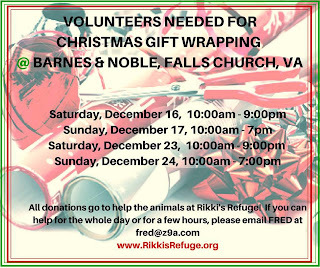 Volunteer Gift Wrappers are needed for Rikki's Refuge on December 16, 17, 23, 24 at the Barnes & Noble Bookstore (Seven Corners Location) in Falls Church, VA! Please contact FRED at fred@z9a.com or Volunteers@RikkisRefuge.org if you can help! 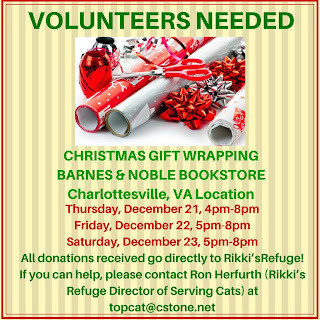 AND December 21, 22, 23 at the Barnes & Noble Bookstore in Charlottesville, VA! All donations received go directly to Rikki’sRefuge! OH NO !!!! Did you forget to get your tickets for our Thanksgiving Day Tour ? 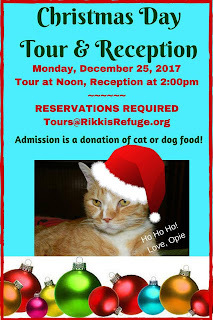 SIGN UP NOW for our CHRISTMAS DAY TOUR at Rikki's Refuge, followed by a small reception at our Life Center. We would love to see you, but you MUST have reservations. get your tickets at Tours@RikkisRefuge.org BUT only if you dare hike off into the wilderness where you have no idea who you may come across ..... will Bigfoote follow the hikers again this year ........ You won't know if you don't sign up !! Sara kept coming to visit Rikki's Refuge since she was an itty bitty baby calf. She was an escape artist living on an adjoining farm. She kept coming over to visit with our cows and sheep and goats and cats and dogs .... Sara was a friend to everyone. We welcomed her roaming our refuge, we wanted her to be allowed to stay, to grow up, to enjoy life with us. Yet she would be retrieved and taken home. But soon she'd be back. And she grew .... and grew .... and now she's about a year old and her family was being sent off to market .... and still .... Sara came to Rikki's .... looking longingly at the safety and protection we offer our animals .... a life ... for as long as god let's them be here. Knowing the end of her life was coming soon, our volunteer Nora, rallied others together and raised the money to buy Sara's freedom. The days the papers were signed and the exchange made, Sara stood there in the driveway that separates our two farms .... our farm of peace and happiness ever after called Rikki's Refuge .... their farm of the cycle of short term life and off to market ... looking over our Sanctuary Manager's (Doug) shoulder as he signed her papers. 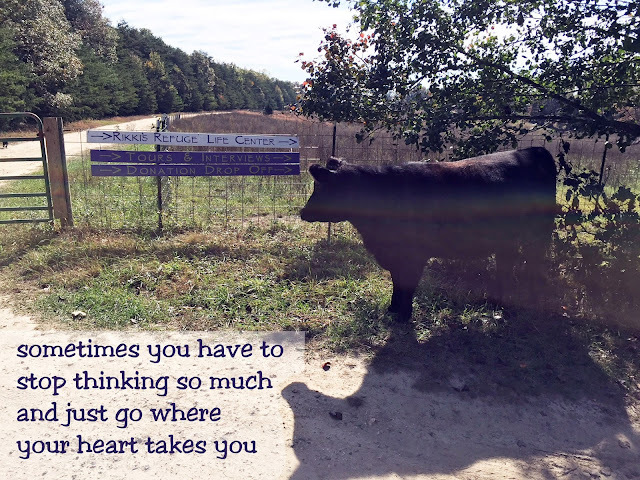 Sara took one last look over her shoulder at her family, already loaded on livestock trucks and ready to ride off to market, she let out a long low mooo ..... and turned and followed Doug to Rikki's and turn our gate to live a life of happy ever after. We are so thankful to those of you who saved Sara from becoming a steak or a hamburger. THANK YOU. It's wonderful people like YOU who support Rikki's Refuge and make it possible for us to feed, house, and care for all these wonderful animals of so many wonderful species who just want peace and happiness and live ..... and YOU make it possible for us to do it .... ONE DOLLAR AT A TIME !!!! 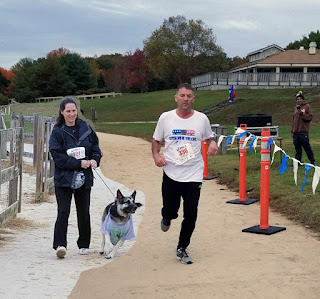 Our 5K Run was a huge success with 78 runners and walkers of two species !!!!! Thank you Dennis and Crystal for sponsoring, coordinating, managing and making the run a huge success again this year !!!!! Congratulations to our 1st place guy Tim Sveum, 1st place gal Tiana Laux, and our Team Winner the Marines !!!! These three little gals won't blow your house down !!!! But they will grow up to be big beautiful girls like our Petunia ... ONLY because YOU went out of your way to save them !!!! These girls were on loan to a pick your own produce place .... what a great place to fatten them up before they'd be going back to the feed lot and slaughter. They learned to love people and got so friendly. One kind person visiting the produce place said WHAT ??? These beautiful creatures are here to learn to love humans, to get treats, pats, to be treated like living beings with a soul and a heart .... and then to be processed into Christmas Ham? She told someone about them, who told someone else, who ....... and I bet you know the rest of the story. She heard about Rikki's and about pigs like Petunia who can live in peace and happiness just being pigs ..... cus you know ... no pig ever wanted to be ham ... or bacon ... no none of them. And now these three little girls are here for you to play with and watch grow up. 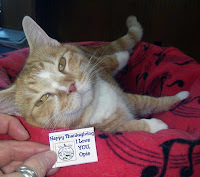 THANK YOU for making it possible for wonderful animals to live out their natural lives !!! Lots of nice hoomans picked and loaded and hauled pumpkins ..... and all the grass eatin, cud chewing, vegivores are very very happy !!!!! We had a lovely ThanksLiving tour and feeding of the animals. Lars, our chief turkey, is a huge supporter of World Vegan Month, November, and he led the ThanksLiving Tour, constantly gobbling the message "Feed us, don't eat us" to all our visitors. KAITLYN SAYS COME MEET ME !!!! Sign up for a tour soon and visit all the critters. Kaitlyn and her friends look forward to seeing you and sharing purrs and love and hugs !!! !